Shane Cantu - The Red, White and Blue Project, Inc. The Red, White and Blue Project, Inc.
United States Army Pfc. Shane W. Cantu, age 20, of Corunna, Michigan, died Aug. 28, 2012, in Charkh, Afghanistan, from shrapnel wounds sustained during an enemy attack. Pfc. 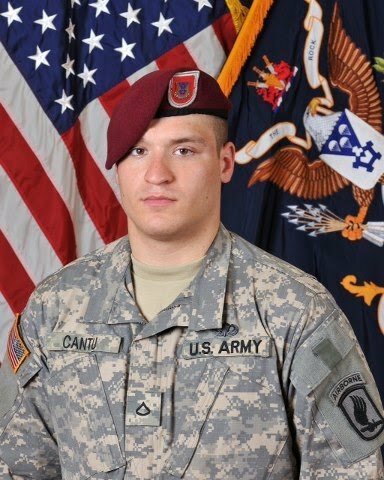 Cantu was stationed with the 1st Battalion, 503rd Infantry Regiment, 173rd Airborne Brigade Combat Team, Vicenza, Italy. Pfc. Cantu was born Oct. 25, 1991, in Owosso, Michigan. He was the son of Jennifer (Cantu) and Michael Clarke. The soldier's family said he had a fun-loving and entertaining personality; always keeping his friends and family in stitches with his sense of humor and many celebrity impressions. Pfc. Cantu looked forward to time spent with loved ones. He had a love for football, and was an outstanding athlete, a leader, at Corunna (Mich.) High School. Pfc. Cantu is survived by his parents; sisters, Shiann, Shanel, Jordyn, BreAnn and Haley; nephews Chance and Cruz; grandparents Ruthann Sanders, Keith (Linda) Clarke and Rosemary Wilson; great-grandmother Margaret Lopez; the love of his life Ciara Agnew; and many aunts, uncles, cousins and other loving family members and friends.